Brick Breaker : Space Outlaw is a fun brick breaking game with the theme of space and intergalactic experiences! Enjoy easy controls, beautiful graphics, and fun that will last you ages! Complete the various mission and get items throughout the game. Break bricks and experience constant brick breaking fun! [How to play] • Easy and simple mechanics that anyone can utilize and enjoy. • Shoot the ball and break the bricks. • Take the ball by moving paddle. • There are many things to destroy such as bricks, monsters, and bosses. • Utilize items to make the game play more fun and diverse. • Clear the stages with your skills and intuitions. 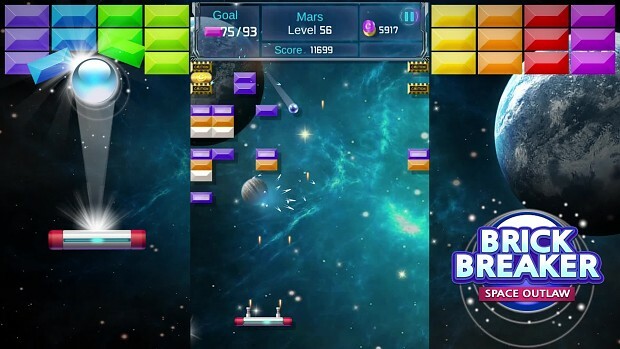 Brick Breaker : Space Outlaw is a fun brick breaking game with the theme of space and intergalactic experiences! Enjoy easy controls, beautiful graphics, and fun that will last you ages! Complete the various mission and get items throughout the game. Break bricks and experience constant brick breaking fun!